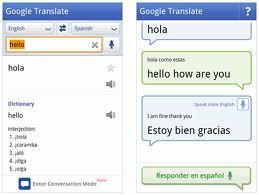 Earlier this month, Google released an incredible app (only for the Android market at this time) that can translate English to Spanish as well as Spanish to English in REAL-TIME allowing for a somewhat stuttered conversation with translations on the fly. At this time from what I hear, it can understand English pretty good, but understanding Spanish is not quite as good. With time, I expect the accuracy to improve to the point that potentially, this app can replace human translators in the exam room. What a boom to breaking down language barriers in the hospital and clinic. At this time, I have to enlist the help of the AT&T translation services. One can only hope that it'll become available on the iPhone soon!